This article lists the Scholarships for college students for study in India or abroad. The article will give details about all Scholarships after 12th available for college going students that are being offered by the government or the private organisations. These will help them in getting aware about the various scholarship opportunities and also availing the financial resources for their higher education. Indian government offers various types of scholarships to help various sections of the society and there are special scholarship schemes for people belonging to financially weaker families, SC, ST and OBC category. There are also scholarships for meritorious students of the general class. Scholarships aren’t just for the school students. In fact, they’re available to college students of all streams from graduation till post-doctorate level i.e. throughout all years of continued education. These scholarships for college students reward the meritorious student and also help the students who are in need of funds to complete their higher education. You can check the following short list of scholarships to give you a jump-start on your scholarship search as a college student. If you are already in college and wondering whether you are still eligible for scholarships? If so, then go through the list of scholarships given below. There are scholarships available even after you’ve started your college journey. Most of the scholarships are given for pursuing professional courses as compared to a degree course because the cost involved is high in case of a professional course. Lots of Opportunities: To search for scholarships as a college student you should use Motachashma where large numbers of scholarships are available to study in India or abroad. Lower awareness level: Many students before taking admission every year look for scholarships that are being offered but frankly speaking the bitter fact is that the students of India are less aware of the scholarships that are being offered so they either drop the idea to continue their studies or choose a degree course which is affordable as compared to a professional course. In the present scenario, many scholarship schemes are available for college students which are either offered by Central Government /State Government or Private organizations. The article acts as a guide for the students about the Scholarships for college students so that they can find the best available scholarships for themselves. Students can check here the list of Indian Government Scholarships for College students. There are many scholarships for college students offered by Indian Government. The below table provides scholarship's name, authority and subjects/streams for which the scholarship is offered. For more information on these scholarships, you can click on the link to read further about the application process, deadline, and eligibility etc. Master Degree Courses in Business Administration, Geology, and Geophysics. For ITI, MBBS, Engineering & MBA Courses. For Girls pursuing undergraduate professional / diploma courses. For North East Students pursuing Graduation in any stream. of the undergraduate course at any IIT or NIT in the country. Check here the list of Scholarships for College students after 12th. There are many scholarships for college students after 12th. The below table provides scholarship's name, authority and subjects/streams for which the scholarship is offered. For more information on these scholarships, you can click on the link to read further about the application process, deadline, and eligibility etc. For pursuing Professional and Technical Courses at Graduate and Post-Graduate levels. For those whose parents cannot afford to pay fees of highly reputed colleges/ institutes overseas or in India. For girls who wish to pursue graduation, post-graduation or PhD studies from Government Recognized Indian Universities. For pursuing the undergraduate or postgraduate course from any recognised university. Besides these scholarships, there are institute specific scholarships which are offered by the institute in which the candidate is enrolled to the meritorious students. Students who are interested in Engineering career can find the list of Scholarships for Engineering students. In addition to the above-given scholarships, there are more scholarships for Engineering Students. The scholarships are given below are for engineering students after 12th. Courses offered in following universities: NTU, NUS, SUTD and SMU. 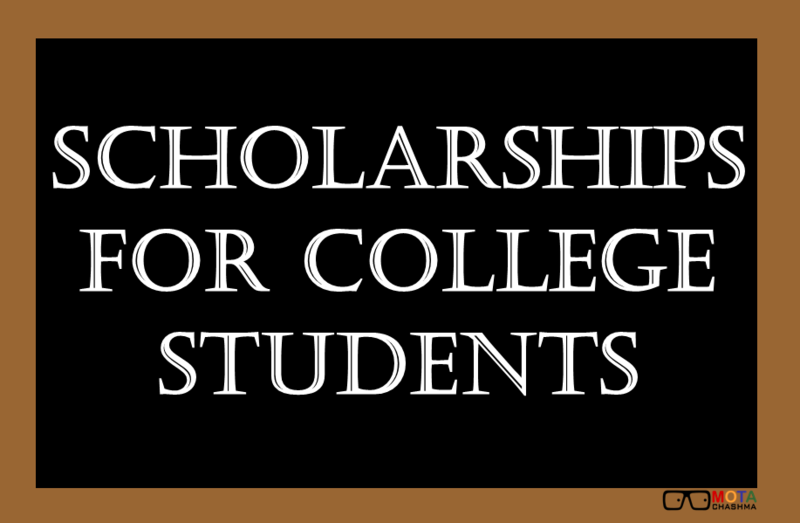 In case of any query regarding Scholarships for college students, you can write in the comments section below.